Happy New Year dear friends ! Finally the brand new CJ’s album is there ! I know there was a long time ago i’m working on it ! It’s probably not the one i first imagine and sometimes takes more time to think about it than work on it… For sure be a daddy, have two works and also be Cyborg Jeff is not so easy ! So for instance, it should be first a ChipDisk coded by K93 and animated by my bros. Pype. That was in 2004 ! 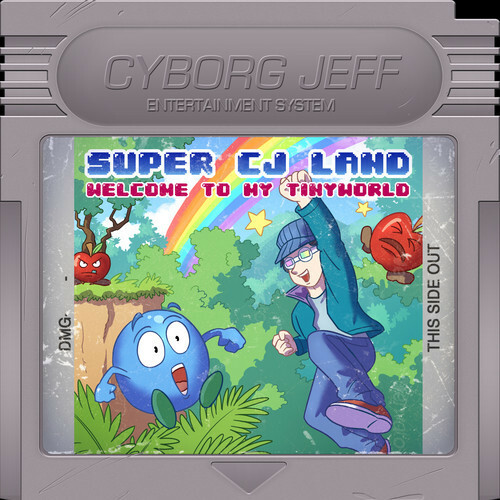 So, Super CJ Land : Welcome to my TinyWorld is not just a simple Chiptunes album nor an album written with just a GameBoy… This is a trip in Cyborg Jeff’s world with all this simple sounds and tinyfication challenges. Tools and software have changed during this long project. 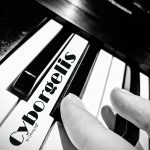 You’ll find musics composed with the Farbrausch FM synthesizer well known in the Demoscene world. You will also listen to tracks sounding like the C64 gold period ! 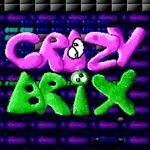 But also some tunes for Video Games like in Amiga and Nintendo ! So i’ll hope this variety will be a strong of this album ! Back on work in 2010 the project still called ‘Email@Elise.com’ and started to received new tracks with some new projects i worked on but also switching from Buzz Tracker to Schism Tracker. One of those projects is the one you could see on the cover. This one was drawed once again by the great Sylvain Sarrailh aka Tohad the author and illustrator of the comics Les Voisins du Chaos where sometimes Cyborg Jeff could appear. So did you recognise this blue bubble and apples in the trees ? Yes, it’s for sure our friend Bilou, the main character of P.P.P. Team Software. 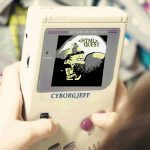 On work still longs years Bilou now lives his adventures on Nintendo DS and you could discover in this album the music of Apple Assault and the brand new School Zone that my brother Sylvain ‘Pype’ Martin have just put online ! This last one tune was an hommage of Rayman Origins. You should also find music from Out’m up, a shoot’m up realised in Assembler and presented during the Inscene 2K with some sequels of that project like the OST of the shoot’m up that should be released with Simon Boigelot (Pyralis) on Windows Phone starring Jack Boost, one of the P.P.P. Team character. Demoscene world, underground universe of multimedia have an important place in this album as the audio scores written for CTRL+ALT+TEST open the album. Composed with audio tools realised by Farbrausch in early 2000 they proposed voyages in the stars, cubes cubes, dots and pixels. in coproduction with LLB (Laurent Lebrun), Pierrick Hansen, Jonhy Walker (Marc Cabillic). Allister Brimble, Alkama, Antoine Reeckmans, Antony Lesuisse, Aspinire, Atiki, Barry Leitch, Be-Games, Ben Landis, Benoit ‘MAF’ Charcosset, Big Chip Compo, Buzzer, Bzam, Chris ‘Zolyx’ Allcock, Chris Huelsbeck, Christophe Héral, Cocasoft, CTRL+ALT+TEST, Dave Wise, Didier Rombauts, DJ Fab, DJ Rams, Dragonus, Dubmood, Evoke, Felix Franco, Frederic ‘Elmobo’ Motte, Flowtherz, Freestyler, Gazus Snake, GDream, GP4Italia, Guillaume Ghrenassia, Inscene, Jake ‘Virt’ Kaufman, Jeroen Tel, Jessica Thirion, Julien ‘Zavie’ Guertault, KB, Kingsteph, Koji Kondo, Laurent ‘LLB’ Lebrun, Lasse Öörni, Lazycow, LDreams, Loonies, Lucie Pier, Main Party, Marc Cabillic, Mika, Nectarine Demoscene Radio, Okeanos, Olivier Borsu, Olmo ‘Cehem’ Lipani, Orange Juice, Owl City, Paranoyak, Pierrick Hansen, Pix n Love Edition, PPP Team Software, PSY, Rez, Razor 1911, Rihanna, Rob Hubbard, Romuald Dispa, Santik, Shortcut, Simon Boigelot, Sophie Philippard, Stéphanie Geron, Steve ‘K93′ Kossouho, Sylvain ‘Pype’ Martin, Sylvain ‘Tohad’ Sarrailh, Ultrasyd, The Skulls, Trackers@Work, TUM Party, Thomas ‘Laxity’ Petersen, Valentin ‘TBOB’ Boigelot, Vega, Vincent Martin, Yero, Yoann ‘Spaneo’ Sirenne, Yonex, Yuzo Koshiro,… Charly, Alice et Juliette. 4KLang VSTi, Goat Tracker, Jeskola Buzz Tracker, Plogue Chipsound ‘DEMO’, Renoise ‘DEMO’, Reaper.